Scottish Cup holders Inverness Caledonian Thistle produced a thoroughly professional performance to see off Livingston in the League Cup. Boss John Hughes said before the game that his team would be "right at it from the start" and that was evident in the early stages. Miles Storey took full advantage of a real mistake by Morgyn Neill to bundle the ball into the net. Danny Devine beat Darren Jamieson with a header to make it two. That result puts the Scottish Cup holders into Monday's quarter final draw. Neill was at fault when the young defender was horribly short with a headed pass back to his keeper, and the Inverness striker Storey will not score an easier goal all season. Livi recovered from the set back and pushed forward with Jordan White, Jordyn Sheerin and Gary Glen all passing up decent chances to equalise. Glen especially should have scored five minutes from the break when former Hearts striker brought a superb save from Owain Fon Williams in the Caley goal when he might have done better with a header from six yards. The miss was compounded when the home defence did not deal with Greg Tansey's free-kick and Devine beat Jamieson with a header at the back post. The second period didn't have the intensity of the first half but the Inverness fans in the 644 crowd got a shock on 49 minutes when David Raven inadvertently nearly put Livi back in the game with a header back to his own keeper which just scraped past the post with Fon Williams struggling. The impressive Ryan Christie then played Storey in again and the big striker brought out a fine save from Jamieson from the edge of the box as the visitors took the sting out of the game and eased their way to the next round. Both managers used their subs late in the game and Caley Thistle's Dani Lopez had a great opportunity for his side's third seconds after coming on, but his left foot shot was saved by Jamieson with a couple of minutes to go. Then Andrea Mutombo blasted a shot off the post as the Premiership side saw the game out. Inverness CT's John Hughes: "I felt we did okay tonight. We dominated the game up until we scored the goals then stopped playing. "We should have scored more goals, Dani Lopez has to be more ruthless. That's not acceptable, that should go in the net. "We were good as a team tonight but I've seen us pass the ball quicker and sharper than that." Livingston's Mark Burchill: "I am devastated to be out of the cup. I have told the players that we cannot get into a situation where we are saying 'we are playing really well, but losing matches'. That is unacceptable. "This is results-driven football and we have two massive games coming up [against Alloa and Dumbarton]." Match ends, Livingston 0, Inverness CT 2. Second Half ends, Livingston 0, Inverness CT 2. Liam Buchanan (Livingston) wins a free kick on the right wing. Andrea Mbuyi-Mutombo (Inverness CT) hits the right post with a right footed shot from outside the box. Attempt missed. Dani López (Inverness CT) left footed shot from the centre of the box is close, but misses to the left. Substitution, Inverness CT. Dani López replaces Miles Storey. Substitution, Livingston. Ryan Currie replaces Gary Glen. Foul by Liam Buchanan (Livingston). Corner, Inverness CT. Conceded by Morgyn Neill. Corner, Inverness CT. Conceded by Declan Gallagher. Substitution, Inverness CT. Liam Polworth replaces Carl Tremarco. Spas Georgiev (Livingston) wins a free kick on the right wing. Substitution, Livingston. Spas Georgiev replaces Myles Hippolyte. James Vincent (Inverness CT) wins a free kick in the defensive half. Attempt saved. 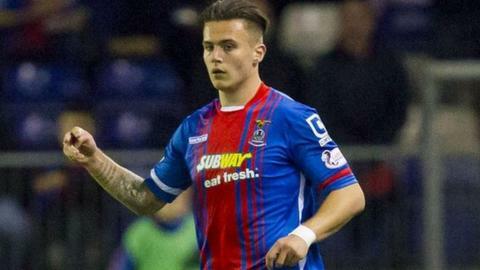 Miles Storey (Inverness CT) right footed shot from the centre of the box is saved in the bottom left corner. Attempt missed. Josh Meekings (Inverness CT) header from the centre of the box misses to the left.